Stefan Karlsson, “Again Herbert Hoover Was No Deficit-Cutter,” Thursday, March 11, 2010. Robert P. Murphy, “Did Hoover Really Slash Spending?” Mises Daily, May 31, 2010. Typically, once such claims are examined they collapse like a house of cards. It is of course true that Hoover often gets unfairly blamed as an advocate of the extreme liquidationist solution to the Great Depression, a solution which was actually recommended by Andrew Mellon (US Treasury Secretary from 1921–1931). In truth, Hoover rejected extreme liquidationism, and attempted to fight the onset of Great Depression with a number of limited interventions, including increased government spending. But the idea that Herbert Hoover’s small budget deficits could ever have stopped the Great Depression remains absurd, and Herbert Hoover ran a federal budget surplus in fiscal year 1930, the first year of the devastating contraction that occurred from 1929–1933. A significant cause of his budget deficits in fiscal years 1931, 1932, and 1933 was the collapse in tax revenues, and his stimulative discretionary spending increases in the budget in fiscal years 1931 and 1932 were a stone in the ocean compared to the massive collapse in US GDP. Far from disproving Keynesian economics, Hoover’s policies reinforce the basics of Keynesian deficit spending, and also show how financial crises and bank collapses need to be prevented, if one wants to arrest an economic spiral into depression. (3) the appropriate level of discretionary spending increases that actually bring about Keynesian stimulus and positive GDP growth. Roosevelt inaugurated March 4, 1933. (2) Since Hoover did not become president until March 4, 1929 he was not essentially responsible for the budget in fiscal year 1929. Hoover was responsible for fiscal years 1930, 1931, 1932, 1933. Roosevelt was not responsible for fiscal year 1933, even though was inaugurated in March 1933. (3) In fiscal year 1930, tax receipts were $4.1 billion. By fiscal year 1933, tax receipts had fallen to $2 billion. In other words, government tax revenue fell by 51.21%. The budget deficits that emerged were the result, to a very great extent, of the collapse in tax revenue, not because of huge increases in spending. (4) The first contractionary phase of the Great Depression in America ran from August 1929 to March 1933. Thus, when Roosevelt came into office, a recovery was just starting to happen. The aftermath of the severe contraction from 1929 to 1933 was what neoclassicals would call a suboptimal equilibrium with high involuntary unemployment. “In 1929 total federal expenditures were about 2.5 per cent of the gross national product (GNP), federal purchases of goods and services about 1.3 per cent and federal construction less than .2 per cent. In 1965, for comparison, these figures were 18 per cent, 10 per cent and 1 per cent” (Stein 1966: 189–223). Thus Hoover’s increase in federal spending of 30.25% in fiscal year 1932 is deeply misleading, because total federal spending as a percentage of GDP was very small in these years, and just 2.5% of GDP in 1929. As noted above, Roosevelt was not inaugurated until March 1933, so Hoover was responsible for the budget in fiscal year 1933 as well. Hoover actually ran a budget surplus in the fiscal year 1930, not a deficit. Hoover’s first deficit was in fiscal year 1931, when the US economy had already begun contracting severely. He also cut spending in fiscal year 1933, and introduced the Revenue Act of 1932 (June 6) which increased taxes across the board and applied to fiscal year 1932 and subsequent years. These were highly contractionary measures, and these two policies are the very antithesis of Keynesianism! An antidote to the conservative nonsense about Hoover can be found in Bruce Bartlett, “The Real Lesson of the New Deal,” Forbes.com, 2.13.09. In order to understand whether deficit spending is truly stimulative, we need to understand the following terms: the output gap, potential GDP, actual GDP, and the Keynesian multiplier. Bartlett shows that once the output gap is calculated and we have a rough estimate of the multiplier in the 1930s (possibly as high as 4) it can be shown that Hoover’s budget deficits and discretionary spending were woefully inadequate. Far from disproving that Keynesian stimulus doesn’t work, Hoover’s spending demonstrates that too little spending in the face of an economic catastrophe is a recipe for disaster. US GDP was $103.6 billion in 1929. It can be estimated that potential GDP during the first years of the 1930s was about $100 billion. For the moment, let’s ignore the impact of state and local budgets (though, as we will see below, that is in fact an important factor). In 1931, US GDP collapsed by $14.7 billion dollars, in a debt deflationary spiral with bank failures and a collapse in employment and investment. If we assume a multiplier of 4 (which is very high), then Hoover’s spending increase of $257 million dollars might have generated at most $1.028 billion of GDP in fiscal year 1931. But GDP fell by $14.7 billion dollars! Only an complete idiot or ignoramus would seriously argue that Hoover’s increase in spending in fiscal year 1931 could have prevented the depression, by effective stimulus to offset such a catastrophic fall in GDP. In 1932, US GDP collapsed by $17.8 billion dollars. If we assume a multiplier of 4 again, Hoover’s spending increase of $1.082 billion dollars might have generated $4.32 billion of GDP in fiscal year 1932. But that was not even remotely enough to stop a collapse in GDP of $17.8 billion dollars. In 1933, Hoover cut spending, a very clear contractionary and anti-Keynesian policy. 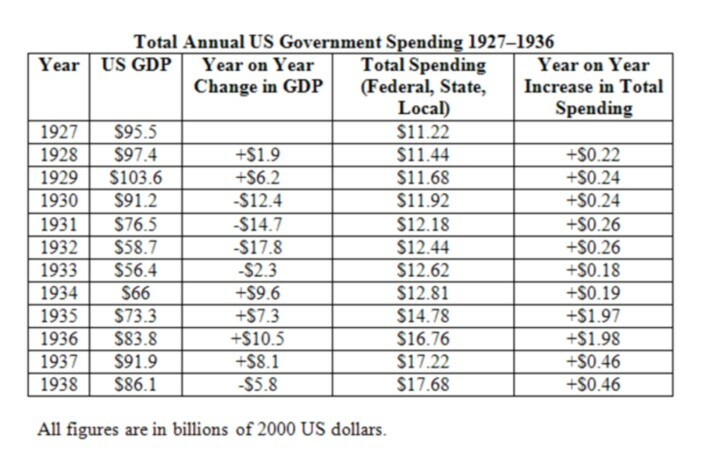 US Government Spending Fiscal Years 1910 to 1960. You can see the collapse in GDP for every year from 1930 to 1933 above, and the increases in government spending. 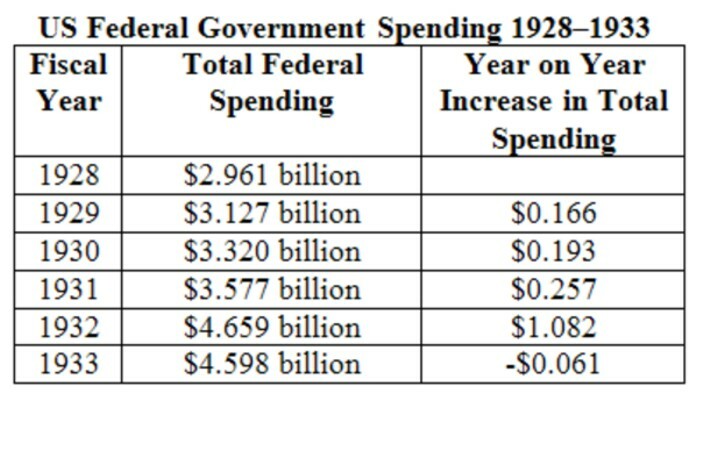 The only real difference is the total US government spending did increase in fiscal 1930 and 1933, but by small amounts, not even remotely large enough (even with a multiplier of 4) to arrest the collapse in GDP. What is also apparent in the figures above is that state and local austerity counteracted Hoover’s spending increases in 1931 and 1932. In particular, what looks like a large increase in federal spending of $1.082 billion dollars in fiscal year 1932 was reduced to just $0.26 billion by state and local austerity. What is also noticeable is that total government spending was significantly increased in fiscal years 1935 and 1936 under Roosevelt, and these were years of strong GDP growth. The myth that Hoover attempted a Keynesian countercyclical policy designed to reverse the collapse in 1929–1933 is one of the most stupid things spouted by Austrians and libertarians. Murphy is of course perfectly correct that Hoover increased spending in 1930, 1931, 1932, but in no sense does that refute Keynesian economics, as he claims at the end of his essay. Murphy makes a great deal of the fact that the Fed lowered the discount rate from 1929 to 1931, which is true. He seems blissfully unaware that Keynesian economics tells us that monetary policy in times of severe economic contraction and depression will be ineffective. The old Keynesian dismissal of monetary policy in these times was summed up in the expression “pushing on a string”, which means that cheap money and low interest rates just don’t create significant aggregate demand when the economy is shocked. It is not remotely surprising that monetary policy did nothing to counteract the depression. This is perfectly absurd. The aim of a Keynesian policy in a downturn is stimulate the economy so that GDP contraction is reversed and positive growth returns. If we assume a multiplier of 3 in 1930, to counteract the Great Depression, the US government would have had to increase spending by $4.13 billion in fiscal year 1930. 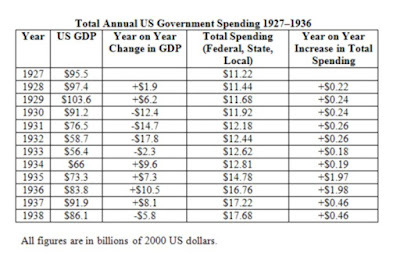 Instead, the total government spending (local, state and federal) increase in 1930 was a miserable $240 million. Again, if we assume a multiplier of 3 in 1931, to counteract the contraction that year, the US government would have had to increase spending by $4.9 billion in fiscal year 1931. 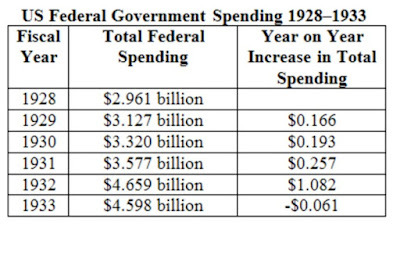 Instead, the total government spending increase in 1931 was a feeble $260 million. Murphy is perfect ignoramus. He hasn’t a clue about basic Keynesian concepts and how to apply them. The idea that the tiny spending increases in 1930 and 1931 could have stopped the depression is pure madness. And even Hoover’s larger increase in 1932 was counteracted by state and local austerity, as we have seen above. Barber, W. J. 1985. From New Era to New Deal: Herbert Hoover, the Economists, and American Economic Policy, 1921–1933, Cambridge University Press, Cambridge and New York. Cary Brown, E. 1956. “Fiscal Policy in the 'Thirties: A Reappraisal,” American Economic Review 46.5: 857–879. Karlsson, S. 2010. “Again Herbert Hoover Was No Deficit-Cutter,” Thursday, March 11, 2010. Murphy, R. P. “Did Hoover Really Slash Spending?” Mises Daily, May 31, 2010. Stein, H. 1969. The Fiscal Revolution in America, University of Chicago Press, Chicago. Temin, P. 1989. Lessons from the Great Depression, MIT Press, Cambridge, Mass. I am unable to see a single statement in those pieces which amounts to, "Hoover attempted a Keynesian countercyclical policy designed to reverse the collapse in 1929–1933". On the other hand, when you say, "It is of course true that Hoover often gets unfairly blamed as an advocate of the extreme liquidationist solution to the Great Depression, a solution which was actually recommended by Andrew Mellon (US Treasury Secretary from 1921–1931). In truth, Hoover rejected extreme liquidationism, and attempted to fight the onset of Great Depression with a number of limited interventions, including increased government spending", you are only repeating all that they have ever said. Why try to find areas of dispute where there are none? Hoover was not a liquidationist and he was not a countercyclicalist, and it seems both sides understand that well enough. "Hoover was not a liquidationist and he was not a countercyclicalist, and it seems both sides understand that well enough. " Austrians like Murphy precisely don't understand it - he ignorantly thinks Hoover's interventions should have stopped the depression, and that they invalidate Keynesian economics. Murphy does not believe that Hoover's interventions "should have stopped the depression" or that they invalidate Keynesian economics. Keynesian economics invalidates itself as it is baseless and unsupported by logic or evidence. It completely ignores real-world human beings and the essential nature of economic calculation. The key points Murphy makes in his book (which you ignore) are that laissez faire did not cause the depression and Hoover wasn’t a “liquidationist” as you put it. On the latter issue, you two apparently agree. In US schools, kids are taught that the depression was caused by laissez faire and was perpetuated by Hoover’s own version of laissez faire. I’m not going to repeat the entire book here, but key points are that the discount rate at the NY Fed in 1931 was as low as 1.5%, that Roosevelt’s spending and deficits were not all that much higher than Hoover’s and that Canada, which engaged in no New Deal style programs, had a much lower unemployment rates throughout the 1930s. Hoover was the first big time interventionist president, his programs were extended and expanded by Roosevelt and the depression then proceeded to last 15 years because of it. Conclusion: Laissez faire didn’t cause the depression and New Deal programs sure as heck didn’t cure it but prolonged it. The Great Depression is fully explained by Austrian theory. "Hoover was the first big time interventionist president, ..."
(1) he ran a budget surplus in fiscal 1930. Some Keynesian or intevrentionist! (2) he cut spending in 1933 and raised taxes in 1932. (3) In 1931 and 1932, the increases in spending were alomost totally offset by state and local austerity. There was no significant fiscal stimulus imparted in these years, yet the economy still collaped. "his programs were extended and expanded by Roosevelt and the depression then proceeded to last 15 years because of it." Not all aspects of the New Deal are supported by modern Keyensians, but there is no doubt the US economy was recovering under Roosevelt's larger fiscal stimulus and jobs programs. And when Roosevelt cut spending and tried to balanced the budget, he caused another severe recession in 1937. The facts refute this Austrian mythology. We are well aware of the 1932 tax increases which I would grant are un-Keynesian. The issue is whether the New Deal cured the economy and whether it was caused by laissez faire. There is no logical or evidentiary basis to assume a free market economy is unstable or that money dilution and/or government spending cures that alleged instability. "The issue is whether the New Deal cured the economy and whether it was caused by laissez faire"
Of course, when you use "laissez faire" you refer to the fantasy, nonexistent world of Austrian economics, where there is FRB, no fiduciary media, and no govenment. Of course, that kind of "laissez faire" didn't cause the Great Depression, because it has NEVER existed in the real world. (6) an economy wide failure of aggregate demand. "There is no logical or evidentiary basis to assume a free market economy is unstable or that money dilution and/or government spending cures that alleged instability." And your "free market economy" is a fantasy, nonexistent world. This is like arguing over how many angels can fit on the end of a pin. We may agree on all six points to a degree. I agree with #6 only to the extent that "aggregate demand" as measured recorded people as being much poorer than they might have been. It's not that “aggregate demand” might have been increased in a sustainable manner with funny money dilution and or government spending or debt and your reliance upon “regulation” is problematic. The point about the 1.5% interest rate in 1931 is that those rates didn’t cure the depression. Austrian theory suggests that such rates would prolong a depression. Thus, from Hoover we got 1.5% interest rates and a huge tax increase in 1932. Not exactly “laissez faire” as urban myth has it. The fact that a pure Rothbardian system has never existed and probably won’t ever exist does not mean that Rothbardian categories are not useful for examining human endeavors as voluntary or under the threat of force or violence. It’s precisely that meticulous examination of voluntary vs. force and/or fraud that you statists wish to avoid (I would call that the Rothbardian test). The issue is ALWAYS whether a particular problem has been CAUSED by voluntary endeavors and whether those problems could have been cured by the threat of government force and punishment. That analysis always brings up the issue as to why one would think a priori that the folks running the government SWAT teams have more wisdom than do the actors themselves, the issue of “regulation”. That is the issue regardless of the level of government intrusion and applies to Keynesianism as well as to the much more restrictive Stalinist systems. But you explained nowhere the meaning the “potential GDP” and “actual GDP” concepts. Actually, I don't understand at all how you may refer yourself to these concepts. "[...] the community’s output of goods and services is a non-homogeneous complex which cannot be measured, strictly speaking, except in certain special cases, as for example when all the items of one output are included in the same proportions in another output." As Keynes, I don’t see how the so-called “GDP” could convey any information about the state of the production. The goods production is devoid of any homogeneity, and, as consequence, cannot be aggregated or, a fortiori, measured. So the "GDP" doesn't deal at all with the "amount" of the production. It only measures the amount of money spent on consumer goods, which a perfectly uninteresting data. Moreover, because the "GDP" measures the amount of money spent on final goods, it is indeed quite easy for a government to increase it: it is just needed, either to print new money, or to shift the current money from investment to consumption. But this increased "GDP" is obviously not laudable. (1) Keynes was wrong about that. Simple as that. (2) Any company that produces heterogeneous goods and sells them can calculate the aggregate monetary value of sales, and then a number of such aggregates adjusted for inflation over a number of years for comparison. Are you really saying that no company can ever aggregate the monetary value of sales to produce a meaningful figure, just because they sell heterogeneous goods? (3) If aggregation is meaningless, why are the only Austrian measures of national output themselves aggregates, essentially either GDP minus G (Rothbard’s Gross Private Product [GPP]), or GDP with intermediate input added (Mark Skousen's “Gross Output” [GO], with commodity factor inputs, manufacturing inputs, and wholesale stages of production added). (4) "So the "GDP" doesn't deal at all with the "amount" of the production. It only measures the amount of money spent on consumer goods, which a perfectly uninteresting data." GDP does not "only measure the amount of money spent on consumer goods". What are you even talking about? GDP = private consumption + gross investment + government spending + (exports − imports). Gross investment includes spending on new housing construction, replacement purchases, net additions to capital assets and investments in inventories. Thus gross investment includes new spending in capital goods, production facilities and factories. These are fundamental parts of the productive sector of the economy allowing it to engage in production. Of course companies may aggregate the money value of their sales. But what information they obtain by doing so? Do they learn something about the production of the other companies? No, of course, they only know how much money they gained (it’s a truism) and, as a consequence, what their drawing right on the production of these other companies will be. They know the percentage of the production cake they are entitled to take, but they know nothing about this cake. More exactly, their monetary gains teach them nothing about this cake, but, evidently, they may have some idea about it: they know what the cake was in the recent past, and they may estimate there will be only small changes in the near future. This drawing right percentage is an interesting data from the point of view of these companies. But, at a global level, this ratio is necessarily 100% and, as a consequence, is of no use. Moreover, it doesn't give any information on the production volume. I don’t deny the “GDP” concept can be used in a static way, that is, in order to indicate (though approximately), at a given moment, what was the distribution of a given aggregate product, for instance among various geographical areas, or among various groups of people. If, within the American economy of 1912, there was the stock of dollars of 2012, which would be the measured « GDP », the 1912’s or the 2012’s? I really think, it would be the 2012’s. I do think the Austrians who resort to “GDP”-like concepts are inconsistent. I was aware Skousen and Soto did so, and I criticized them for this reason. I noticed Rothbard was not critical enough regarding such aggregate concepts but I didn’t know so far he had his own brand of “GDP”-like concept (I have not yet read Power and Market). Anyway, I will read it and if, as I think, Rothbard fails to address the heterogeneity issue I will criticize him as well. ” GDP does not "only measure the amount of money spent on consumer goods". What are you even talking about? GDP = private consumption + gross investment + government spending + (exports − imports).”. Mea culpa, I have erred. I was thinking about the absence of integration of the intermediary products. I never studied the details of the “GDP” computation, because I disagree with the very basics of such an aggregate. Nevertheless, it was only a subsidiary critique. I have read in America’s Great Depression, the appendix called “Government and the National Product, 1929-1932”, where Rothbard defines his Gross Private Product. What is the purpose of such a concept? Rothbard writes he’s trying to “estimate the extent of government depredation on private product”. So, in this book at least, he’s absolutely not trying to “measure” the production. He wants to estimate the allocation of a given production between two groups, the public and the private sectors. He doesn’t pretend at all to give any information about the volume of the production. If Hoover's intervention "wasn't enough" - then FDR's intervention should have worked. You can't look at the bust without considering the boom that preceded it. The boom, just like the housing bubble, was caused by cheap credit. The oft-cited analogy is often to alcohol but ought to be caffeine - it sends a signal that you're not getting more tired. Ultimately you need to just catch up on your sleep. Sorry - stronger stimulants aren't the answer. I'd say it did work. Growth was robust and unemployment was falling steadily. If there wasn't the 1937-38 recession, unemployment (by my math) would've been a bit over 6% by WWII. I know there are two different measures of unemployment, one that excludes those in gov programs...even that number fell steadily. You are right about the boom but, ironically, the money supply is created by the private sector itself. Endogenous money, as its called, and a Central Bank can't touch it, at best they can have some mild influence on it. So cheap credit and all was a product of the banking sector. THIS is where the "post keynesian" school succeeds, they look at private debt where no one else does. Check it out, US private debt, grew during the 1920s and spiked during the Depression. Our recovery was so slow because we were paying it down. Much like we are today. If not for FDR the recovery would've been even more anemic. Worse would've been pursuing austerity. We saw how that worked in 1937, and modern day Europe, but some still wanna try. I will partly agree, we dont need stronger stimulants...what we need is a permanent jobs program to keep the body well maintained. Then we wont have as big a need for stimulus. Bigger did work though, WWII was the new deal on steroids in a way, and it clearly worked.